Galganov's Easy Recipe for Cherry-Almond Bread! 4 mini-loaf pans or a loaf pan of, about 8" x 4"
Place cherries in food processor with metal blade and pulse about 5 times to get cherry mush without liquifying them. Preheat the oven to 325ºF (163ºC). In the other bowl, combine the eggs, sour cream (or yogurt) and sugar beating the mixture until the sugar is fully incorporated. Pour the combined wet ingredients over the dry and fold them ONLY until the dry mixture is no longer dry. Place your loaves (or loaf) in the center of the oven and bake for 25 minutes. Test for doneness and return to the oven for no more than 5 minutes at a time before testing again. (A toothpick or skewer inserted into the middle of a loaf should come out without sticky batter on it. A Quick-Bread Baker's Tip: Be very careful not to over-mix the batter. Batter which has been over-beaten or over-mixed will yeild a hard, chewy or rubbery (or any combination of these) quick bread. Don't over-mix! Mini loaf pans are great - you can share a whole (mini) loaf or freeze whole, small loaves to enjoy, fresh, later. To defrost a frozen mini-loaf, simply set it on a counter until it's soft. Special Tip! Cut your loaves into slices using a sharp, non-serated (smooth-bladed) knife while still frozen. This can virtually eliminate crumbling and significantly reduce crumbs. Variation: Add 1/2 to 2/3 cup chocolate chips to make a more desert-like treat. 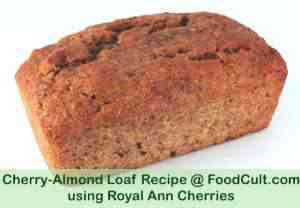 Nutritional data for this Cherry-Almond Bread - is estimated and rounded to the nearest whole number. The measure of two slices totalling 1.6 oz (45 g) is based on cutting a total of 10 slices from each mini-loaf. This recipe makes four (4) mini-loaves (20 servings). Click Here to read about removing stones from cherries. This recipe is for a "Quick Bread". A quick bread does not use yeast and so it does not want kneading or rising times. It is more in the nature of the ever-popular banana bread ... a little like a dessert or coffee loaf. This quick bread, just like banana bread, can be made as a muffin - just adjust your baking time a little. What this also means is that if you have a little too much batter, make a muffin with it (but you'll have to pull it out of the oven before the loaves are ready. Unlike yeast risen breads which are "tap-tested" for doneness, quick breads are tested with a cake tester ... or a toothpick. We use a piece of a bamboo skewer to test for doneness. While this is a vegetarian recipe it does use a little bit of dairy and eggs. It is a delicious, relatively healthy desert loaf high in fiber and rich in flavour - using cherries when in season OR pulp you may have saved from juicing cherries when in season! You also get the benefit of almonds - one of the wonderfully nutritious nuts high in beneficial omega fatty acids. Unlike most of our recipes, this particular recipe calls for a food processor ONLY if you are using whole cherries instead of left-over pulp from juicing. *Values are estimated & rounded to the nearest whole number.